James Ellison is on course to appear at Donington Park as a wildcard entry in a fortnight’s time for round 11 of the World Superbike Championship, despite injuries to his right hand that put him out of the Cadwell Park BSB last weekend. Ellison had to sit out the two races on Bank Holiday Monday when an injury to his arm caused too severe during the F1-style qualifying session on Sunday. Ellison picked up the injury riding on a Honda Enduro launch a week prior in Malaga alongside Cal Crutchlow and Leon Haslam. Ellison said the ripped tendons in his lower right arm and hand were caused by the strain of riding and spent Monday in pit lane with a brace on his injured arm. 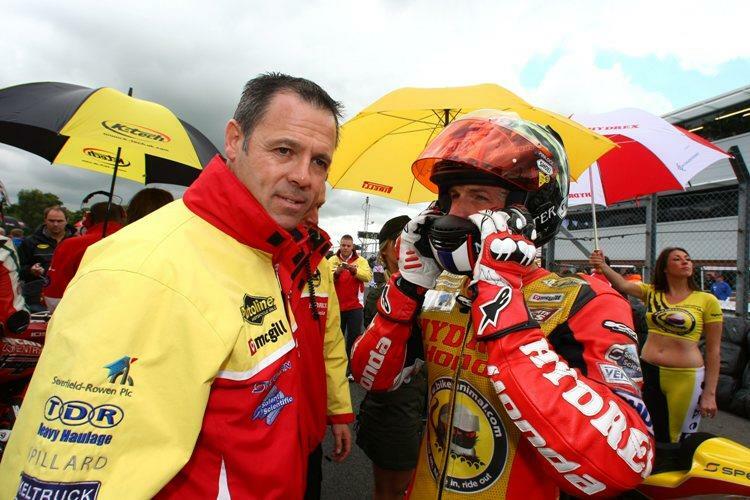 But Hydrex Bike Animal Team Owner Shaun Muir said the former Grand Prix and AMA star was still on course for a wildcard appearance at Donington Park for the up coming World Superbike round. Muir told MCN: “We are waiting on Friday night or Saturday morning to make our decision on James. That’s when the splinter is due to come off his arm, but he’s on a course of daily injections and there is no reason why the injury shouldn’t be sorted for Donington.